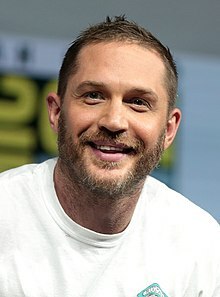 Hardy's television roles include the HBO war drama miniseries Band of Brothers (2001), the BBC historical drama miniseries The Virgin Queen (2005), Bill Sikes in the BBC's miniseries Oliver Twist (2007), ITV's Wuthering Heights (2008), the Sky 1 drama series The Take (2009), and the BBC historical crime drama series Peaky Blinders (2013–17). He created, co-produced, and took the lead in the eight-part historical fiction series Taboo (2017) on BBC One and FX. Edward Thomas Hardy was born on 15 September 1977 in Hammersmith, London, the only child of artist and painter Anne (née Barrett) and novelist and comedy writer Edward "Chips" Hardy. His mother is of Irish descent. Hardy was brought up in East Sheen, London. He studied at Tower House School, Reed's School, and Duff Miller Sixth Form College. He later studied at Richmond Drama School and the Drama Centre London, a part of Central Saint Martins. He has named Gary Oldman as his "hero", adding that he imitated scenes from the actor while at drama school. ^ Young, Niki May (20 January 2012). "Celebrity patron Tom Hardy helps save homelessness charity from closure". Civil Society. Retrieved 16 June 2018. ^ "For Tom Hardy, Adoption Is the Only Option". PETA. Retrieved 16 June 2018. ^ "British Stars Take A Run At Beating Cancer". Sky News. 8 September 2014. Retrieved 16 June 2018. ^ "Dalglish and Thompson head honours list". BBC News. 9 June 2018. Retrieved 16 June 2018. ^ "From rehab to royal honour: Tom Hardy is made a CBE". The Irish News. 8 June 2018. Retrieved 16 June 2018. ^ Hadfield, Tom (25 August 2011). "Tom Hardy timeline". The Daily Telegraph. Retrieved 15 January 2014. ^ "Tom Hardy biography - Celebrity A-Zs GLAMOUR.com". Glamour.com UK. Retrieved 30 June 2013. ^ Grainger, Lisa (18 April 2013). "Tom Hardy's Travelling Life". The Daily Telegraph. Retrieved 15 January 2014. ^ "From misfit to Mad Max". Taipei Times. 9 January 2014. Retrieved 15 January 2014. ^ Maher, Kevin (5 March 2009). "A tough life for Bronson actor Tom Hardy". The Times. London. ^ Fisher, Alice (4 July 2010). "Tom Hardy: the rake's progress". The Guardian. London. ^ "The U.K. movie star and the Vancouver tattoo artist he can't get enough of". The Globe and Mail. 23 August 2012. Retrieved 20 June 2015. ^ Head, Steve (9 December 2002). "An Interview with Tom Hardy". IGN. Retrieved 4 June 2011. ^ "Tom Hardy Biography". Biography.com. Retrieved 25 June 2015. ^ "Tom Hardy: Real-life blows that shaped my acting". The Telegraph. Retrieved 31 December 2018. ^ Dickens, Andrew (18 September 2011). "Meet Tom Hardy". ShortList. Retrieved 23 February 2017. ^ Reynolds, Simon (16 September 2011). "'Tinker, Tailor, Soldier, Spy' Tom Hardy video interview: 'Gary Oldman is my hero'". Digital Spy. Retrieved 23 February 2017. ^ "Tom Hardy wins modeling contest in 1998". Entertainment Weekly. 23 August 2012. Retrieved 25 June 2015. ^ "Way Back When: Tom Hardy". screencrush.com. 8 November 2012. Retrieved 25 June 2015. ^ "The Strange roles of Tom Hardy". /filmschoolrejects.com. Archived from the original on 12 May 2015. Retrieved 25 June 2015. ^ "Tom Hardy's Rap Mixtape from 1999 Is Actually Kind of Fire - Noisey". Noisey.vice.com. 19 January 2018. Retrieved 20 November 2018. ^ "Is Tom Hardy's 'Star Trek: Nemesis' screen test better than the finished film? -". Entertainment Weekly. 30 July 2012. Retrieved 25 June 2015. ^ "An interview with Tom Hardy". ign.com. 9 December 2002. Retrieved 25 June 2015. ^ "Evening Standard Theatre Awards: the rise of eight Outstanding Newcomers". Standard. 17 December 2014. Retrieved 25 June 2015. ^ "Olivier Awards 2004". olivierawards.com. Retrieved 25 June 2015. ^ "The Virgin Queen". BBC. Retrieved 25 June 2015. ^ "A for Andromeda". BBC. Retrieved 25 June 2015. ^ "The weekend's TV: Stuart: A Life Backwards". The Guardian. 24 September 2007. Retrieved 25 June 2015. ^ "WAZ". Empire. Retrieved 25 June 2015. ^ "Handsome Devil". /www.out.com. 30 October 2008. Retrieved 25 June 2015. ^ "Guy Ritchie Has Finished 'RocknRolla' Sequel Script; Waiting On Schedule To Shoot". 13 December 2011. Retrieved 25 June 2015. ^ "Actors Who've Gone Big". Empire. Bauer Consumer Media. 13 March 2009. Retrieved 8 December 2009. ^ Sanborn, Victoire (16 January 2009). "Wuthering Heights "Is Mr. Heathcliff a Man?"". pbs.org. Retrieved 25 June 2015. ^ "Heathcliff in Wuthering Heights". pbs.org. Archived from the original on 22 January 2009. Retrieved 25 June 2015. ^ Jones, Kenneth (13 February 2010). "Tom Hardy Journeys Goodman's Long Red Road, a World Premiere, Starting Feb. 13". Playbill Web site. Archived from the original on 15 February 2010. Retrieved 22 March 2010. ^ Potempa, Phillip (24 February 2010). "OFFBEAT: Goodman Theatre's 'The Long Red Road' is brilliant masterpiece". nwi.com. Retrieved 22 March 2010. ^ Hieggelke, Brian (22 February 2010). "Review: The Long Red Road/Goodman Theatre". Newcity Stage. Retrieved 22 March 2010. ^ "Tom Hardy Replaces Fassbender in Tinker, Tailor, Soldier, Spy". Comingsoon.net. 3 September 2010. Retrieved 15 January 2014. ^ "Tom Hardy joins WB's first-look roster". Variety. 7 March 2012. Retrieved 15 January 2014. ^ Ryan (13 October 2010). He was filming in Alvor, Algarve, Portugal through the summer of 2011 for this role as well as other locations throughout Europe. "Tom Hardy Joins Batman 3 Cast; Fury Road Delayed". reelzchannel.com. ^ Zeitchik, Steven (7 December 2010). "Shia LaBeouf and Tom Hardy will be bootleggers". Los Angeles Times. Retrieved 10 February 2011. ^ "Doug Liman To Helm 'Splinter Cell' With Tom Hardy". Deadline.com. 19 March 2014. Retrieved 20 June 2015. ^ Graser, Marc (14 November 2012). "Tom Hardy game for 'Splinter Cell' movie". Variety. Retrieved 8 November 2013. ^ "Riz MC - Sour Times". youtube. Retrieved 16 July 2015. ^ Hoad, Phil (22 April 2015). "How is Tom Hardy's $50m Child 44 such a totalitarian fail?". The Guardian. Retrieved 21 February 2016. ^ ""Mad Max: Fury Road" Review". 25 May 2015. Retrieved 15 June 2017. ^ Rosenberg, Adam. "Tom Hardy landing the starring role in "Mad Max: Fury Road" is an amazing turn of events for that franchise". MTV. Retrieved 3 March 2011. ^ "Tom Hardy gives new life to 'Mad Max'". USA Today. 14 May 2015. Retrieved 16 July 2015. ^ "Review: 'Mad Max: Fury Road' an 'out-of-control reboot'". canadaam.ctvnews.ca. 15 May 2015. Archived from the original on 18 May 2015. Retrieved 16 July 2015. ^ "Mad max Fury". rotten tomatoe. Retrieved 16 July 2015. ^ "Mad Max: Fury Road". box office mojo. Retrieved 16 July 2015. ^ "Tom Hardy wins Best Actor at British Independent Film Awards". 11 December 2015. Archived from the original on 15 December 2015. ^ "The 88th Academy Awards (2016) Nominees and Winners". Academy of Motion Picture Arts and Sciences (AMPAS). Retrieved 14 January 2016. ^ McNary, Dave (23 March 2016). "Harry Styles, Fionn Whitehead to Star in Christopher Nolan WW2 Action-Thriller 'Dunkirk'". Variety. ^ Swift, Andy (23 November 2015). "Tom Hardy's FX/BBC One Drama Taboo Adds 13, Begins Production". TVLine. Retrieved 11 August 2018. ^ "Tom Hardy Is Signed for Three Venom Movies". CBR. 25 August 2018. Retrieved 29 August 2018. 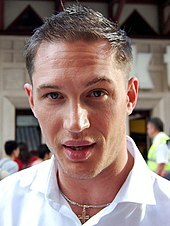 ^ "Tom Hardy signed for three Venom films". www.msn.com. Retrieved 29 August 2018. ^ "Venom & Black Cat Movies Will Be 'Adjuncts' to the MCU's Spider-Man". 18 June 2017. ^ Kroll, Justin (10 October 2016). "Tom Hardy to Star in 'Spider-Man' Movie 'Venom,' Ruben Fleischer to Direct". Variety. ^ Hipes, Patrick (30 October 2016). "Tom Hardy To Play Al Capone In New Movie 'Fonzo' From Josh Trank – AFM". Deadline. Retrieved 29 October 2016. ^ Mike Fleming Jr (22 June 2016). "Tom Hardy To Play War Photographer Don McCullin In Working Title Drama | Deadline". deadline.com. Retrieved 12 November 2016. ^ "Tom Hardy & Charlotte Riley Are Expecting, & Their Children Are Going To Be So Beautiful". Bustle. 3 September 2015. Retrieved 7 January 2017. ^ "Tom Hardy 'wasn't a fan of school'". The Belfast Telegraph. 14 March 2014. Retrieved 3 May 2014. ^ Davies, Serena (11 June 2009). "Interview: Tom Hardy, from East End gangster to romantic hero". The Daily Telegraph. UK: Telegraph Media Group Limited. ^ Lauren Smith (22 September 2014). "Tom Hardy got married in secret - two months ago". Glamour. Archived from the original on 21 October 2014. Retrieved 21 October 2014. ^ "Tom Hardy Expecting Second Child!". 3 September 2015. Retrieved 3 September 2015. ^ Sabrina Barr (11 January 2019). "Tom Hardy and Charlotte Riley 'name newborn son after Forrest Gump'". The Independent. Retrieved 12 January 2019. ^ Rebecca Macatee, "Tom Hardy Gets a Kiss From His Dog Woodstock in Pro-Adoption Campaign for PETA—See the Pic!" EOnline.com, 28 April 2015. ^ "I first saw Woodstock running across a turnpike we... - tomhardydotorg". Tom Hardy Dot Org. Retrieved 10 June 2017. ^ "Hollywood star Tom Hardy has paid a special visit to the capital to meet disadvantaged young people supported by The Prince's Trust". Retrieved 16 July 2015. ^ "Actors Tom Hardy and Charlotte Riley become patrons of Bowel Cancer UK". 13 July 2012. Retrieved 16 July 2015. ^ "When are Prince Harry's Invictus Games and what are they?". The Daily Telegraph. 8 May 2016. Retrieved 2 October 2016. ^ "Debrett's 500 List: Film". Debretys. 21 May 2017. ^ "Tom Hardy: I was lucky I didn't get AIDS from drug use". Yahoo!. Retrieved 31 March 2017. ^ "Actor Tom Hardy reveals past addictions still haunt him". Chrysalis Courses. Retrieved 20 November 2018. ^ "Bronson - Tom Hardy Online". Tom Hardy Online. Retrieved 31 March 2017. ^ "An Oliver for our times". The Daily Telegraph. 15 December 2007. Retrieved 25 June 2015. ^ Billington, Michael (28 April 2003). "In Arabia, We'd All Be Kings". The Guardian. Retrieved 2 August 2012. ^ Jaquest, Oonagh (13 June 2003). "Review: The Modernists". BBC. Retrieved 14 January 2017. ^ Hickling, Alfred (17 June 2003). "The Modernists". The Guardian. Retrieved 14 January 2017. ^ "Blood at the Royal Court Theatre". Royal Court Theatre. 2003. Archived from the original on 29 October 2010. Retrieved 3 May 2014. ^ Clapp, Susannah (28 March 2004). "Festen". The Guardian. Retrieved 14 January 2017. ^ Sierz, Aleks (3 February 2007). "From rehab to Restoration comedy". The Daily Telegraph. Retrieved 20 June 2015. ^ Oxman, Steven (22 February 2010). "Review: The Long Red Road". Variety. Retrieved 14 January 2017.